For years I worked weekends and could never get to the St. Johns parade. I had to find out what I had been missing. My plan was to take in a kaleidoscope of sights and sounds. It was a safe bet I’d be hearing squeals and giggles of children along with brass instruments, revved up engines, whistles and drum blasts. I expected to see plenty of colors and blurry motion. 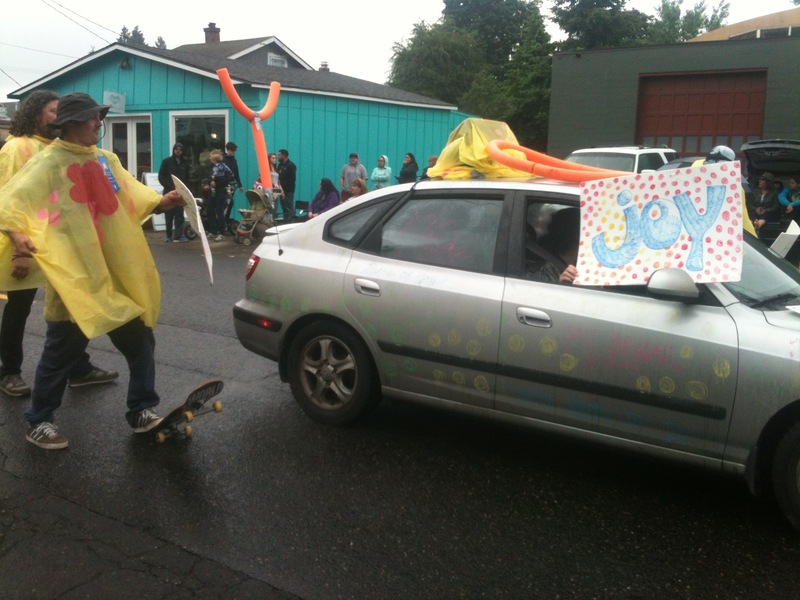 By the time I found a place to park, I ended up popping up in what I thought was the middle of the parade. I began a chase for the front. The sidewalks were clear but when I arrived at Ivy Island, the old gateway to downtown, I felt wedged in. I was across from the guns and ammo store and had caught up with as much of the parade as I was going to catch so I stayed put. Standing against a chainlink fence next to a construction site, I realized the battle for Ivy Island had been lost. The Rose City Model T Club rolled by. Old cars make the best parade subject matter! 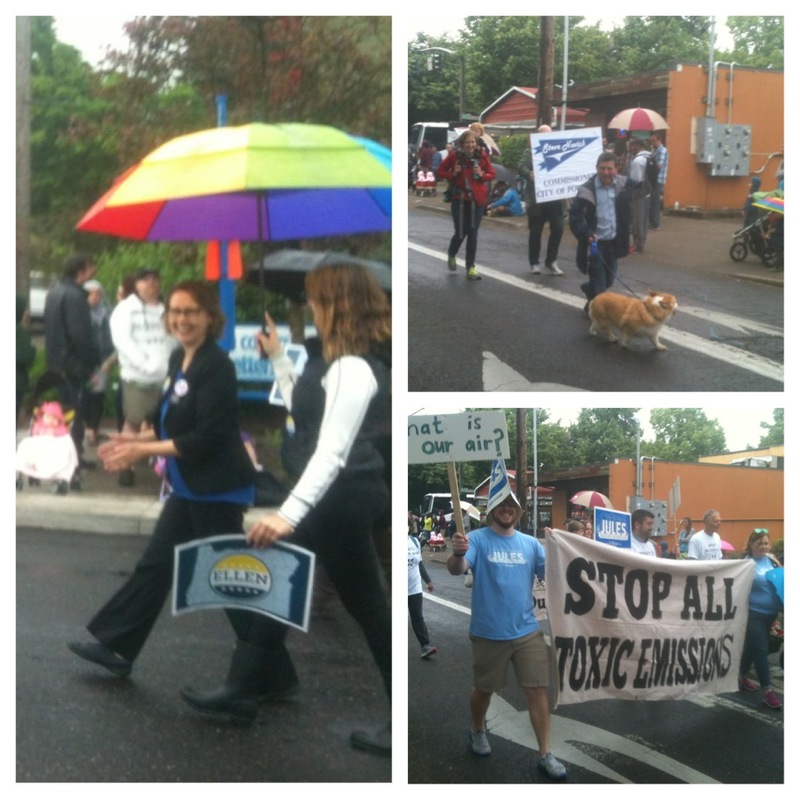 Early on the parade was clogged with politicians. It made sense with the election three days away. My inner cynicism kicked in. My brain flooded with snide thoughts. A waving Dan Saltzman reminded me of how politicians never really look at you. Ted Wheeler seemed in need of a stylist which is probably unnecessary for Portland politics. Steve Novick takes his dog everywhere. I realized it was going to be too brazen and probably unethical to trade a Sarah Iannarone vote for a piece of bubble gum. Jules Bailey impressed me. He wasn’t riding in a convertible and his entourage walked the talk carrying signs with messages concerning air quality. After seeing so many old cars and a couple of dune buggies, I got excited about seeing of all things—a boat! 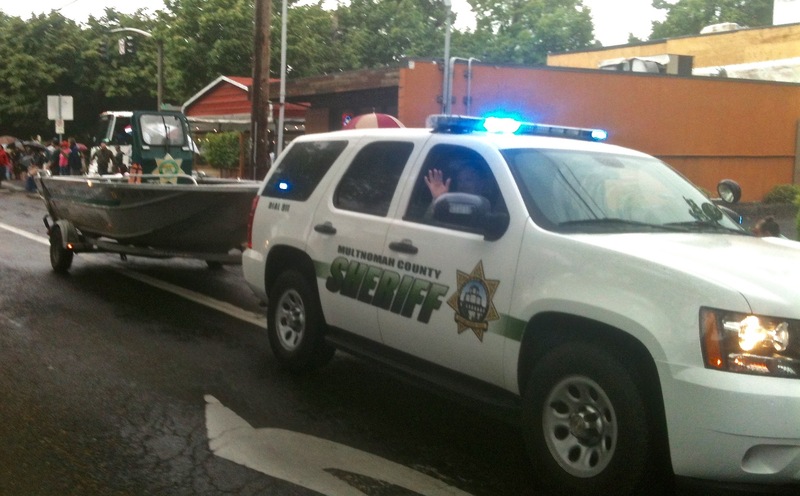 The Multnomah Sheriff’s department dragged along a river patrol boat. My transportation topper was Teeter Roofing and their gang of ATV riders, something you don’t often see at parades. 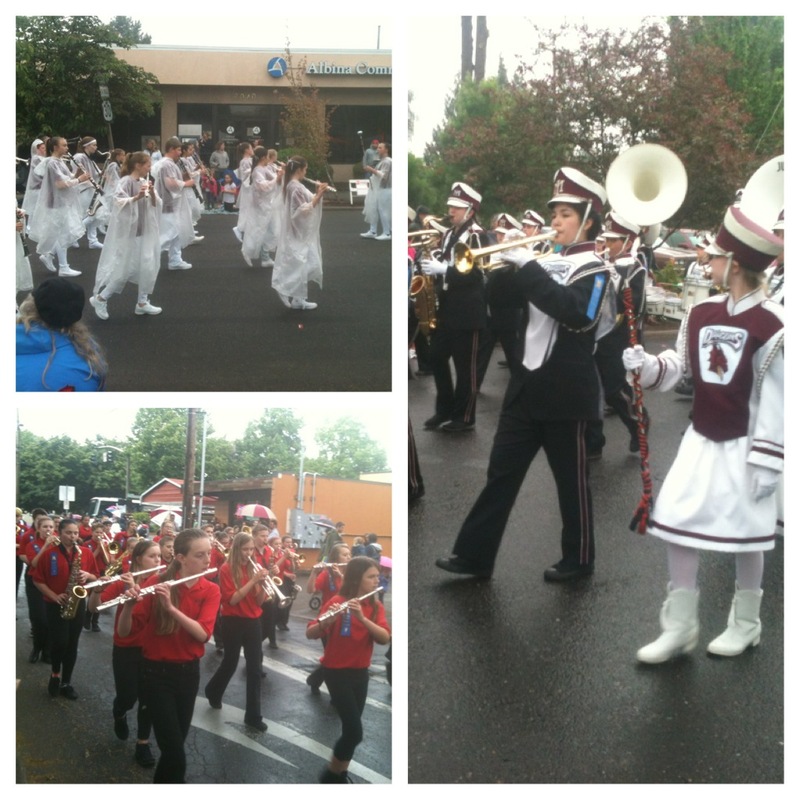 More middle school bands marched by. It didn’t seem to matter what song they played. They all had a warm, warped sound, like vinyl. It occurred to me that transportation was the major theme of this parade as Miss Teen Rodeo Oregon brought her posse of assistant teen queens by on horseback. Soon after the Clark Country Saddle Club followed. 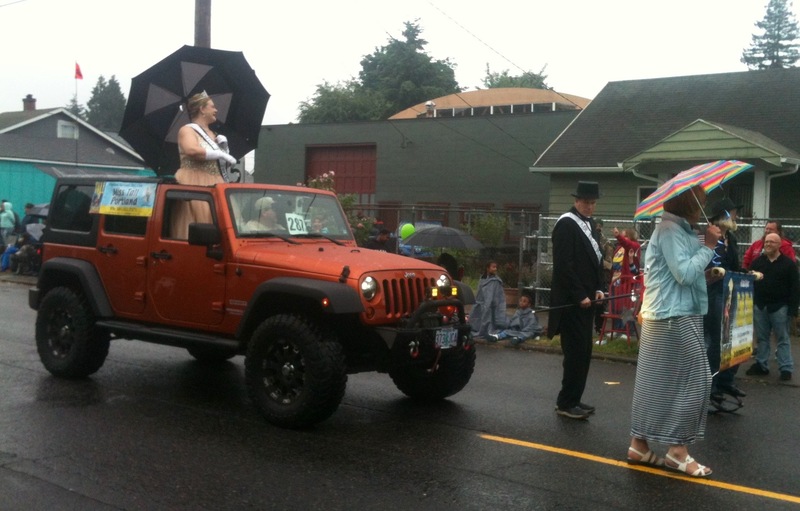 It was great to see how young ladies in sparkly country outfits and cowboy hats are another parade must-have. I realized I was missing the parade watching it through a camera phone so I headed back through the onlookers to another spot. The rain made me realize I needed water proof paper and floats! As the Roaring King Car Club weaved back and forth along the route I realized there was something cool about a car club. The cars looked like modified ex-police cars with a basic design but I’m guessing supped up engines. 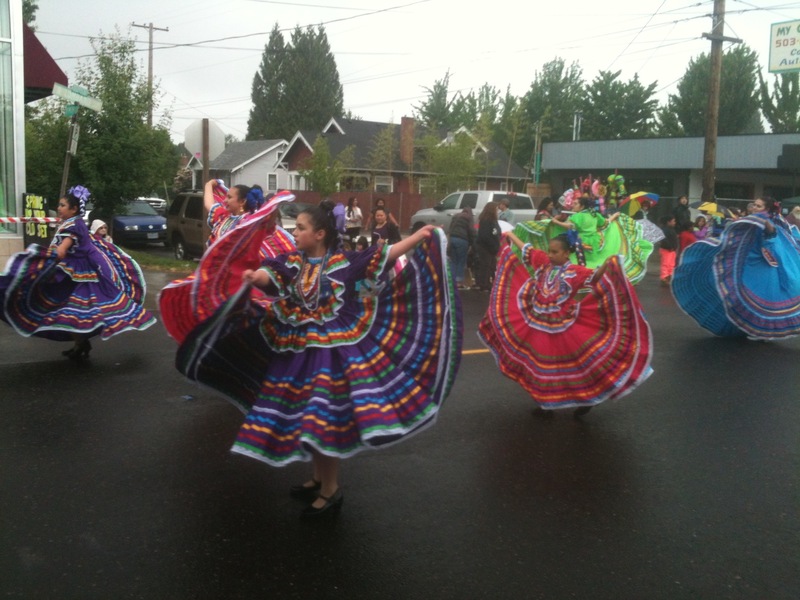 The Mexican dancers twirled around in colorful dresses that cut through the gray skies. I have no idea why someone was making comments about caterpillars as they swirled past. 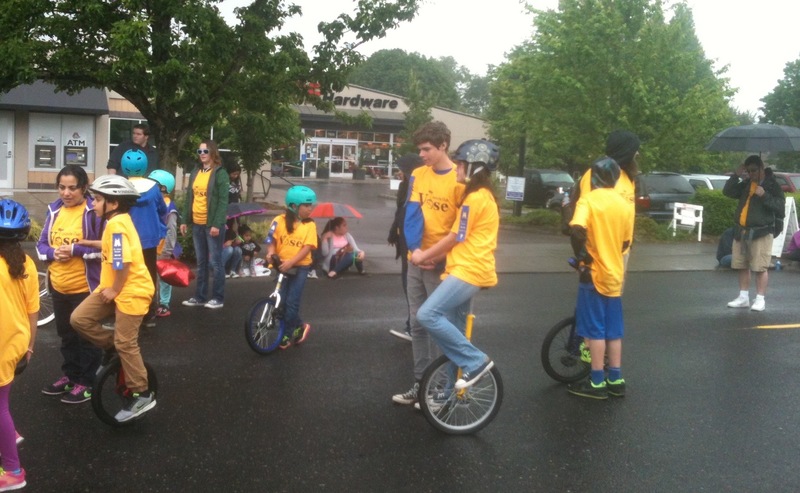 Then just when I needed to see unicycles the most—they appeared! Another middle school band passed playing Ozzy Osborne’s “Crazy Train.” Tall people at parades began to get on my nerves. Floats? 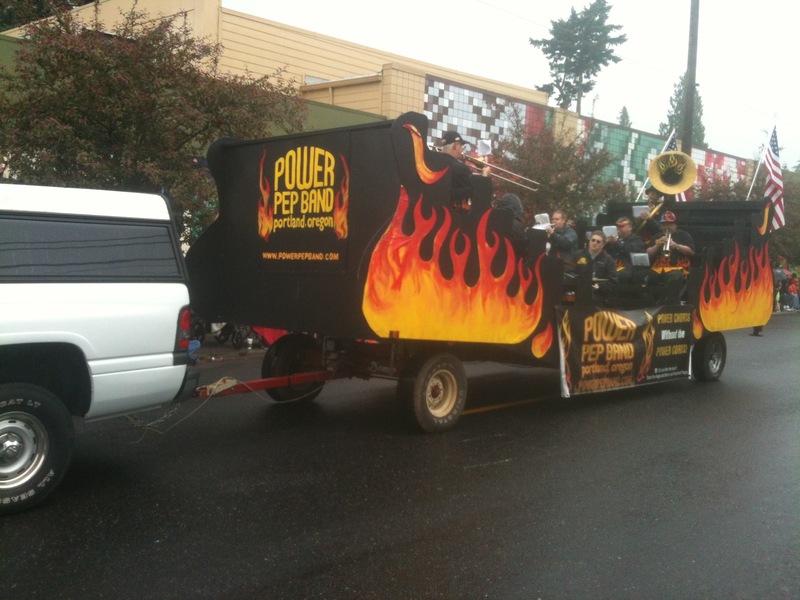 I was getting desperate for floats when the Power Pep Band rolled by in what looked like a ship on fire. Ronald McDonald was working the crowd behind this float. He was too chatty. There is nothing worse than a talking clown. Although his make-up was impeccable and his hair poofed and cherry red, he creeped me out in the kind of way I’d feel if I looked at a hamburger patty too long. Behind me I heard a mother say, “Stop whining about it,” which brought me back to the parade and the crowd. I wanted a picture of Ronald. I still hadn’t forgotten the year he was made Grand Marshal. My camera malfunctioned when I hit a button that turned the screen white. By the time I figured it out Ronald McDonald was too far down the street. As I considered whether to chase him down, it occurred to me that he gets all the publicity he needs from having been on TV all the time in the 70’s. With Ronald out of the picture, I spotted a woman in full clown regalia in the crowd. My need for a clown photo fix drew me to her. I caught up to this clown, passed her and turned to get a photo. She seemed happy to comply or was this happiness due to the perma-grin painted on her face? She suggested a selfie which I attempted but due to being selfie impaired I failed. Ugh! No selfie with the lady clown. I began to wonder if the parade would ever end, my only real complaint was about the rainy weather. I spotted Ellen Rosenblum parading by. She was running for Oregon Attorney General. It’s fun to find a politician with a sense of humor. I heard Ellen say, “Vote now, vote yesterday.” Due to Oregon’s ballot by mail system people were able to vote early either by mailing ballots or dropping them off. Little Leaguers walked by and another middle school band played Michael Jackson complete with dancers doing Thriller moves. Then I watched a tall tuxedo clad man stroll in the street while a woman wearing a tiara waved from a Jeep. These were representatives from the Skyliners Tall Club. Tall people were now in the parade instead of standing around watching it and blocking other people’s views. The rest of the parade was a blur due to the rain on my glasses. A car held out a sign with the word JOY scrawled on it. I found out later that this was the theme of the parade. This part of the proceedings felt spontaneous with a car driving around with someone holding a sign out the window. The enthusiastic, low budgetness of it all was joyful. Pirates announced themselves with obnoxious gun fire. 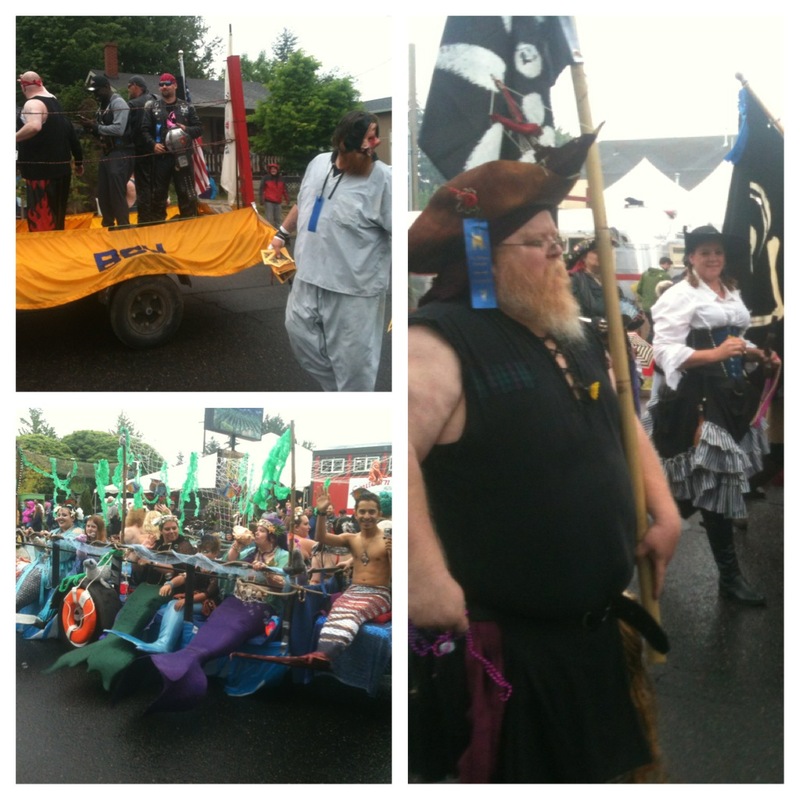 But at that point I was witnessing what felt like a holy gathering, a culmination of a very St. Johns-centric trilogy of Pirates, Wrestlers and floats full of mermaids. Realizing I could catch the rest of the parade on the way to my car I followed the remaining participants back through to the staging area. 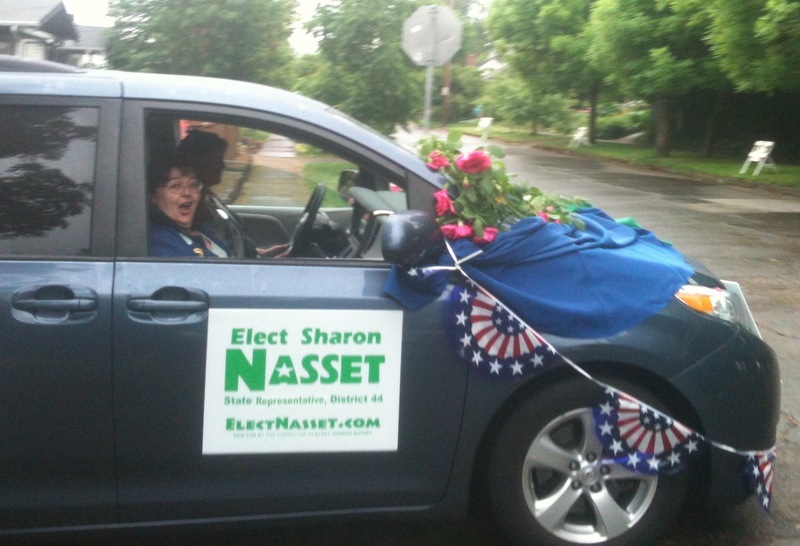 Sharon Nasset was riding shotgun in a mini van—not even in a convertible. She seemed keep the lowest profile of the bunch. 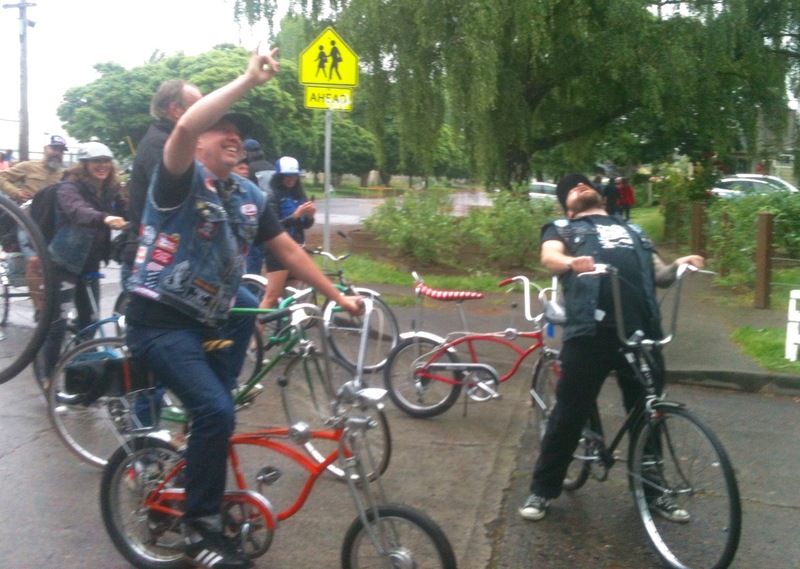 A biker gang, well bicyclists on bikes with long handle bars known as Belligerent, were rounding out the parade. A man with a bull horn rode his bike in a circle announcing that the parade committee was “saving the best for last.” I rounded the corner and ran out of parade. 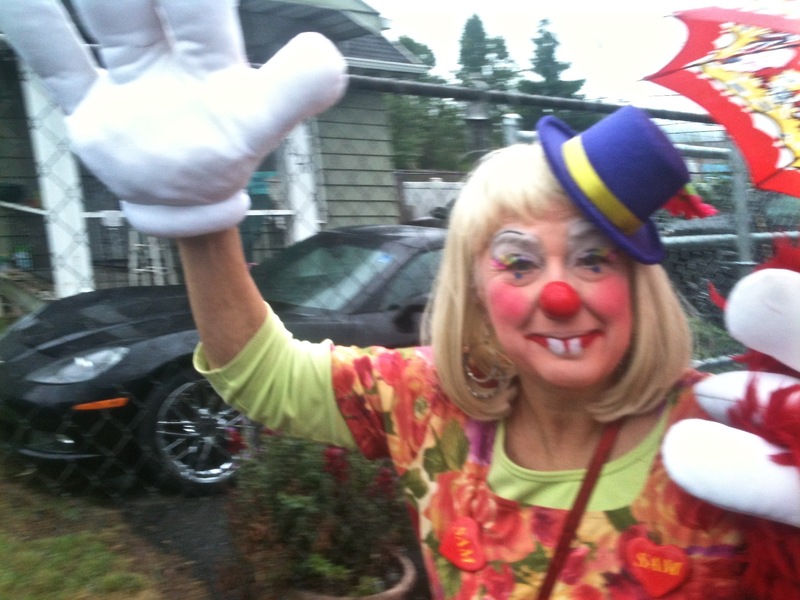 I now had the choice of going to the car or meeting back up with the lady clown who was clamoring away from the parade. I’d had almost enough excitement for one day so headed home.